If you need a simple method to keep your child by your side, our Child Safety Tether (formerly known as our Belt-to-Belt Tether System) is the perfect solution. The Child Safety Tether is ideal for keeping everyone together when walking through parking lots, shopping at the mall, visiting crowded theme parks, traveling through busy airports, or visiting foreign countries. The Child Safety Tether is intended for children who are neurotypical, or for children with special needs such as Autism or Down syndrome who DO NOT require the high level of security provided by our Special Needs Safety Harness. As with all our products, the Child Safety Tether was developed in response to our customer's requests. Elaine has made a number of belts with tethers over the years; one of them being for a father of a 7 yr old boy with Autism. 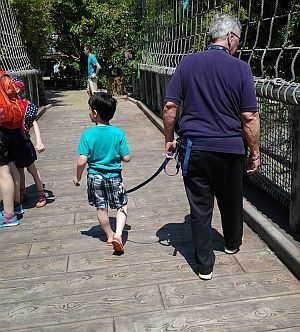 The father was considering a harness, but the more he described his son's behaviour, the more it became clear that a harness was more equipment than the boy needed. Elaine suggested a belt with an O-ring suspended from it and 3 tethers of different lengths; a 4 foot tether for the Dad to use when walking on the sidewalk, and two longer ones (a 10 foot and a 20 foot tether) for the park. Each tether had a snap hook at the end to attach to the O-ring on the boy's belt, and a hand loop at the other for the Dad to hold. Since then more orders have been made, including a Child Safety Tether with a Locking Buckle on the child's belt and the tether as a Tie Down for a 10 yr old boy with Down syndrome, and a Child Safety Tether for parents of a 7 yr old neurotypical girl in preparation for their extensive trip abroad. Given the number of requests we have had over the years for these belts, it was high time to add a new page to our website! As with all our products, we use top quality polypropolene webbing and USA-made buckles and sliders. Re-inforced stitching on all seams ensures strength and durability. Both the child's belt and the parent's belt are adjustable with plenty of extra webbing to make them longer, and to wear on the outside of heavier clothing or winter coats. You should really only need to purchase ONE of these systems to last you as long as needed. The 4 foot tether is long enough to give your child some roaming room but short enough for them to walk beside you without (hopefully!) having excess webbing drag on the ground. Slip the small loop end of the tether onto the child's belt. Their belt should be comfortable and a bit loose. This will allow the tether to slide easily on the belt and allow the child to walk in front, beside, or behind their parent. 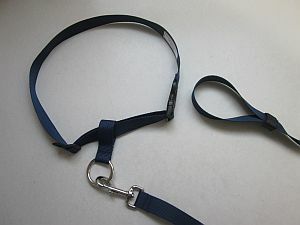 The other end of the 4 foot tether has a large hand loop which the parent can either hold or slide onto their own belt, allowing them to use the Child Safety Tether "hands-free". The "hands-free" option is particularly useful when the parent has another child to carry, a stroller to push, shopping bags to carry, or luggage to pull. Available in black, navy blue, pacific blue, red, and purple, and mixing of colours is usually the norm! 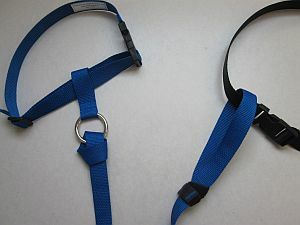 There are a number of Accessories that you can add to your order to increase the security of your Child Safety Tether. Keep in mind that your child WILL ALWAYS have access to the buckle on their belt. If you are concerned they will remove their belt against your wishes, then this product IS NOT for them! They MUST be in one of our Special Needs Safety Harnesses instead. a floating O-ring, $3.99, can be added to the child's belt. Attach the tether to the O-ring. This avoids opening and closing the child's belt each time you want to attach/remove the tether. the tether can be made with a snap hook at the child's end, $4.99. Attach the snap hook to the O-ring ($3.99) on the child's belt. Additional Tethers. They can be any length you like. Please state length and colour of each, e.g. 2.5 ft = black; 7 ft = pacific; 4 ft = purple; etc. NOTE: All tethers will be made in the same style, e.g. if you request a snap hook above, all spare tethers will be made with snap hooks. A confirmation of your order will be sent to your email address. Text Box for comments or instructions for us. (only click once) We will confirm your order by email before sending you your invoice. Use the "Back" arrow on your browser to return to our website after submitting your order.